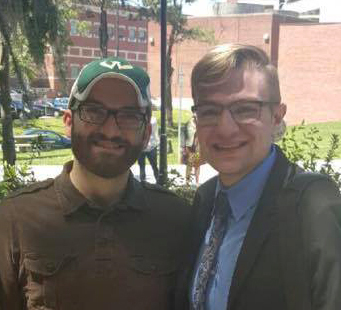 Gainesville, FL – Wayne State University sophomore Kevin Mardirosian (Westland, MI) finished fourth in the nation in the country’s premiere collegiate competitive speech tournament, the American Forensics Association’s National Individual Events Tournament (AFA NIET). In the largest category of competition – Prose Interpretation – Mardirosian placed fourth overall out of the best 27 entries from throughout the United States. Hosted by University of Florida, April 2–4, 2016, the AFA NIET requires students first to qualify in order to gain entry into the tournament. To get to nationals, Mardirosian, pictured on the right here with WSU Forensics Graduate Assistant Coach Nick Prephan, had to finish at or near the top of several competitions throughout the year. Once there, he was up against elite competitors from repeat championship schools such as Bradley University, West Kentucky University and University of Texas–Austin. "Finishing this well at the AFA NIET is a program first for Wayne State University," said Dr. Kelly Young, WSU associate professor of communication and director of forensics. "While the competitive speech and debate teams have existed since 1918, we have not finished this high at this tournament. Last year, we won a national championship at the National Forensics Association – a more open invitation tournament – but we have finished in the semifinals of the AFA NIET tournament only last season and reached the quarterfinals in 2007." As a communication studies major and a high school competitor, Mardirosian has much experience with preparing for competition. Assistant Graduate Coach Jade Metzger described Mardirosian's preparation for this tournament: "During his coaching practices, Kevin comes prepared with memorized pieces, sets goals for those sessions and performs his speeches in whole or in part. The coaching staff provides him with feedback for improvement, which can include speeding up to stay in time, pausing, movement and articulation." On March 20, Mardirosian won a championship in After Dinner Speaking at the Pi Kappa Delta national championship hosted by University of Kentucky, a tournament sponsored by a national honorary society for competitive speech and debate activities. Reflecting on his achievements, Mardirosian noted, “Forensics has been, and always will be, my life. It gave me a voice and it showed me that determination and belief in one's self is the only way to be truly successful and happy. I can't thank my Wayne State family, coaching staff and teammates enough for the support. I couldn't have done it without them!" 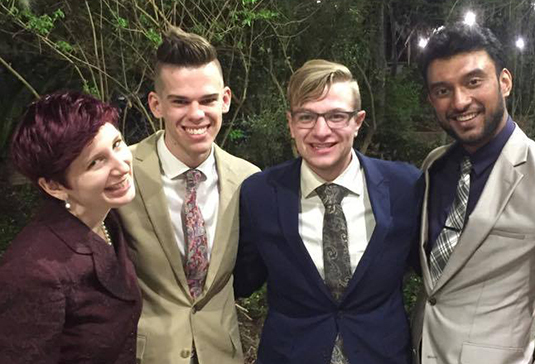 Also representing Wayne State at the 2016 AFA NIET competition were, pictured below (Mardirosian is third from left), Gaia Klotz (senior, Midland, MI), Nick Norton (senior, Detroit) and Imran Nahin (senior, Glen Allen, VA).